The subject of Jewish extremism and anti-Arab terrorism both pre and post the official creation of the State of Israel in 1948 is fraught with much emotion, especially for Jews, Israelis, and Zionists, such as your humble correspondent. And yet, this topic is both highly relevant and of immense importance to the successful continuation of the Zionist project. The editorial policy of this resource requires us to tell the truth about the Zionist movement and its ongoing project, Israel. We tell this truth form a pro-Zionist perspective, but never sweeping under the carpet the dangerous, counterproductive, and yes, even immoral and even evil byproducts of the movement. Zionism was from the outset a completely secular movement. Its founder, Theodore Herzl, was an assimilated Austrian Jew, who traveled across the vast expanses of the Austro-Hungarian Empire, encountering in its eastern frontiers, places like today’s Romania, Moldova, and Hungary a multitude of Jews who were poorly assimilated into their host societies and often hated and resented by them. He heard first hand accounts of the pogroms in the nearby Ukraine then a part of the Russian Empire and understood that the vast East European Jewry was sitting on a powder keg that was about to blow. Herzl’s solution was a return to the ancient homeland of the Jewish people, the Holy Land, the Land of Israel, then commonly known by its Roman name: Palestine. Seeing as Palestine was a province of the Ottoman Empire, this idea required support from the Sultan, and later, after the collapse of the Ottomans and the conquest of much of the Middle East by Britain in the aftermath of WWI, of the British government. And right here, at this early stage, the ostensibly secular Zionist movement had to reveal, mostly to itself, that it was not so secular after all. Convinced that there indeed existed a “Jewish Question”, meaning the imminent genocide of Eastern European Jewry, the British politely asked why not resettle the Eastern European Jews in another one of their colonies, one that was less geopolitically volatile and whose native inhabitants did not carry as much favor with the Brits as their ever-favorite Arabs: Uganda. This offer was rejected by the Zionist Congress on the grounds that Palestine and not Uganda was the national home of the Jewish people. But why? What makes it so? There can be no doubt that Jews today are the descendants of Jews who lived in Judea in the time of Christ. But did they retain their title to that real estate after an almost complete absence of more than fifteen centuries? The argument that there were “always” Jews in Palestine doesn’t hold water; there were “always” Jews in Egypt, Greece, and Babylonia (Iraq) too, but nobody is claiming these territories for the Jews. The argument that Jews were “forced” to leave, “exiled” by the Romans, is historically incorrect. From the Judean population that existed prior to the Great Revolt and the Bar-Kochba revolts in the first and second centuries AD, many were killed by the Romans, many stayed and accepted first Christianity and then Islam, and some left to seek better opportunities in the diaspora, where large Jewish communities had already existed. Jews today, myself included, are the direct descendants of this last group. So if they left to seek a better life, if, in today’s parlance, they were economic refugees, hadn’t they forfeited their rights to their historical homeland? The key to Jewish eternal ties to their homeland is not purely historical. It cannot be explained solely by archaeology. It is primarily religious, spiritual, transcendent. It comes from generations upon generations of Jews in places as far away from each other as Yemen and Latvia reciting in their ancestral Hebrew language the names of places in the Judean desert and in the Galilee, and on the coastal plain of the one place they beseeched the Almighty to bring them back to: Israel. This religious foundation of Zionism is utterly inescapable; without it, there can be no possible explanation why a group of people who had abandoned their homeland would even remember it, let alone wish to come back to it nearly two millennia later. The opening verse of “HaTikva”, Israel’s national anthem sums it up best: “Our hope is not yet lost, the hope of two thousand years, to be a free People in our Land, the Land of Zion and Jerusalem.” (translation: BP). As the Zionist movement gained steam and registered some early successes in the first decade of the 20th century, it split the Jewish religious community into those who stood in opposition to it as “forcing the hand of God” to bring forth the Messiah and those who saw His hand in the movement itself. In the words of the prayer that is said in every Synagogue around the world on Saturdays and High Holidays: “Our Father who are in heaven, Israel’s Rock and Savior, bless the State of Israel, which is the seed of our deliverance.” (Translation: BP). In adopting this view, the Rabbis who started the Religious Zionist movement justified Jews taking up arms to first conquer and then defend Israel, by clearly stating that they were an instrument of Divine deliverance rather than rogue actors who wished to spur God into action before He was ready. This alliance between secular and religious forces, albeit an uneasy one, made Israel possible; it was the sufficient condition for its success. Of course, before Israel could become a state, the Land of Israel had to be freed of its colonial masters, the British Empire. Though Britain was granted by the League of Nations the mandate to manage Palestine on the condition that it implement the Balfour Declaration and establish on the territory of the Mandate (today’s Jordan and Israel including Judea and Samaria) national homes for both Arabs and Jews, Britain betrayed this condition almost immediately by restricting Jewish immigration and assisting the Arab population in every way possible to the detriment of the Jewish settlers. This blatantly one sided pro-Arab policy escalated throughout the 1917 through 1948 British control of Palestine. By restricting Jewish immigration even during the run up to the Holocaust and in its aftermath, while at the same time allowing unrestricted influx of Arabs from the entire Middle East, the British were making the Jewish dream of an independent state all but impossible and creating a fertile ground for the still ongoing Israeli-Arab conflict. In response, the Jews formed armed forces and engaged the British with a variety of guerrilla tactics. The same forces fought off Arab attacks and engaged in retaliatory raids against the Arab population. This period, from the mid 1930’s through the creation if Israel in 1948 gave rise to what could be called by some Jewish terror. An argument raged within the Jewish community in Palestine: just how aggressively should we take the fight to enemy, be they Brits or Arabs. The mainstream leadership of the Jewish community preferred restraint, while other, smaller factions favored a more aggressive posture including attacks on civilian targets. This divide came close to causing a Jewish civil war, something that would have undoubtedly destroyed the Zionist movement and prevented Israel from ever becoming a state. The religious wing of the Zionist movement got a tremendous boost with the near miraculous Israeli victory over Egypt, Jordan, and Syria in the 1967 Six Day War. The liberation of East Jerusalem and the Temple Mount together with the ancient ancestral homeland areas of Judea and Samaria could not be seen by religious Zionist as anything other that direct Divine intervention. But the secular Israeli government was far more cautious. 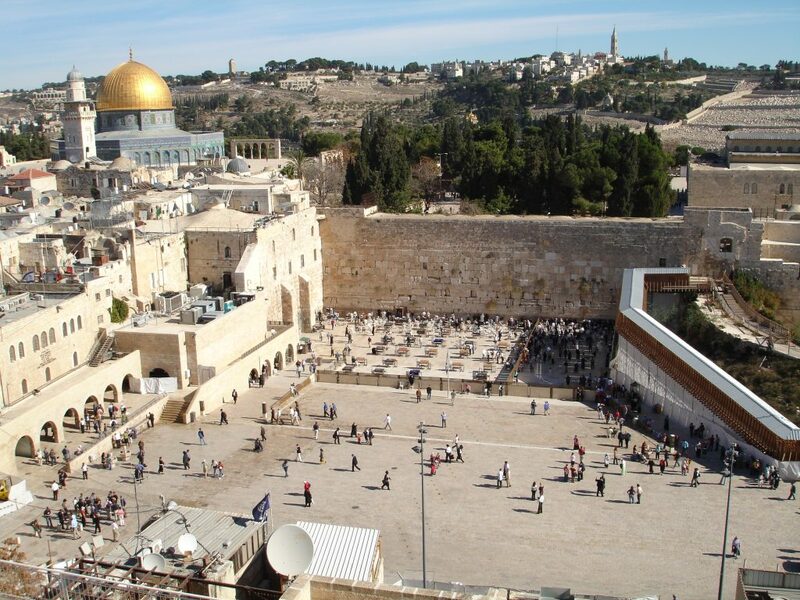 It ordered that control of the Temple Mount platform that currently houses the Al-Aqsa mosque complex stay with the Muslim authorities and it initially forbade any Jewish settlement in Judea and Samaria. The nearly disastrous Yom Kippur war six years later toppled the cautious and secular Labor government and for the first time ever brought forth a coalition of the right of center Likud party and the party representing the religious Zionists who were chomping at the bit to settle Judea and Samaria as quickly as possible. This created the dynamic that still exists today; successive Israeli governments following the pragmatic Zionist approach seek to settle the Israeli-Arab conflict by dividing Judea and Samaria between the Jews and the Arabs. Extreme elements in the religious Zionist movement vehemently oppose such a compromise. As decades passed, the growth of Israeli settlements in Judea and Samaria, many of which are now bona fide cities, gave rise to daily friction between Jews and Arabs occupying the same small geographical area. Mutual suspicion and hatred abound. hidden by a curtain in a marble Holy of Holies, visited once a year by the High Priest intoning his long since lost True Name. I believe that He would much prefer dwelling in the midst of his People, one of the most dynamic and fascinating people on Earth – the Israelis.